Exploring the canyonlands of Utah...Red Canyon, Zion, Bryce, and beyond. 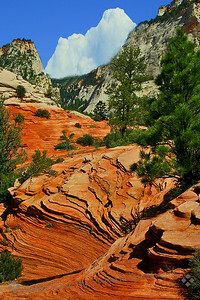 This view of the striations in the rock was seen near the road going through Zion on the way to Bryce Canyon. 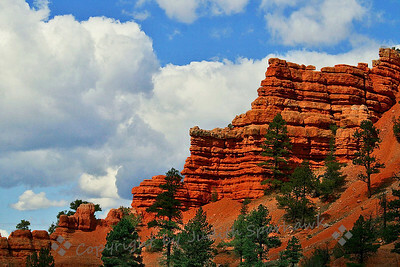 On the way to Bryce Canyon, you pass through Red Canyon--amazing in its own right. 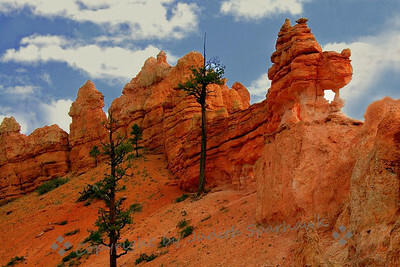 These well-known Red Canyon Hoodoos made me think of a couple standing up on the rocks, overlooking the canyon. 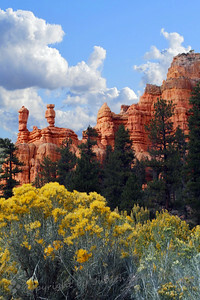 This view of the iconic hoodoos of Red Canyon includes the yellow flowers that were blooming in this September visit. A stop at Red Canyon before getting to Bryce Canyon. 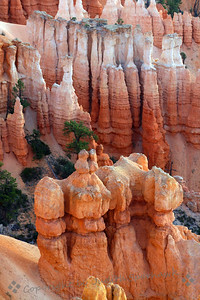 A view of Bryce Canyon, showing its intricate hoo-doos in many colors. 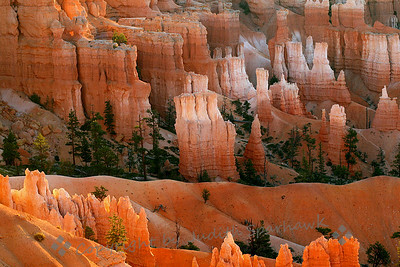 Low angled sunlight soon after sunrise, give what appears to be an inner glow to the rock formations known as hoo-doos in Bryce Canyon, Utah. 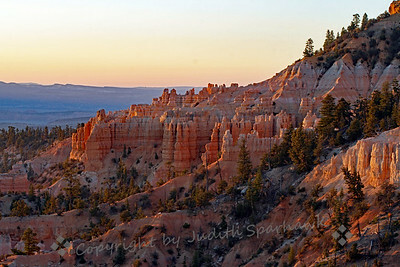 This sunrise was, paradoxically, shot at Sunset Point, Bryce Canyon, Utah. 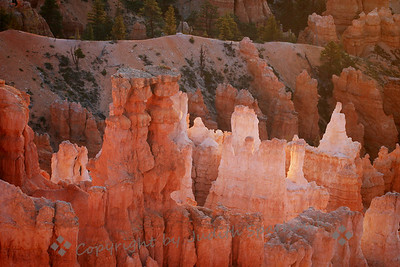 The early low light seemed to light up the Bryce hoo-doos with an inner glow. 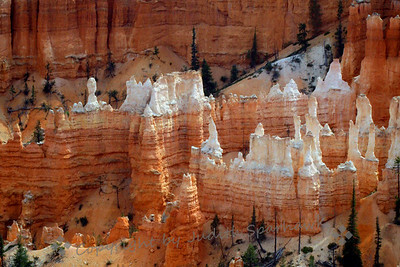 Closer view of Bryce Canyon formations. 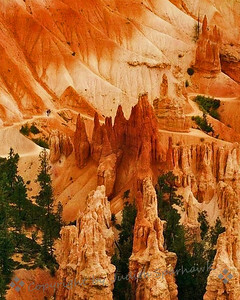 Bryce Canyon, Utah. The people hiking this trail show the immensity of some of these hoo-doo formations along the way. I saw the formation in the upper right as looking like castle towers, thus the title. I especially liked this formation, which reminded me of the Acropolis on the hillside in Greece--but of course was just another amazing rock formation in Bryce Canyon. Another overview of the canyon, showing layer after layer on into the distance. 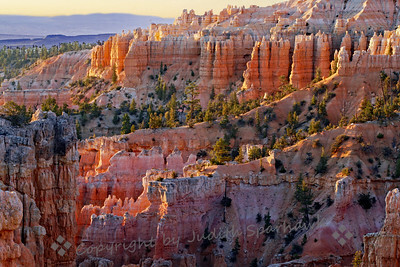 This shot of Fairyland Canyon was taken just after the sun rose over the horizon, hitting the spires and hoodoos, leaving much of the canyon in shadow. 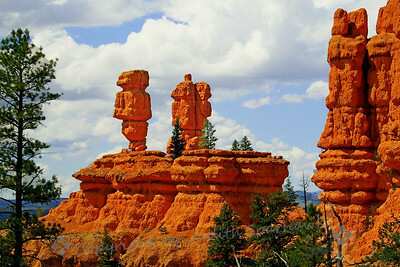 This is a view in Fairyland Canyon, which made me think of a lot of people standing att attention, all looking in the same direction. I liked the various shades and colors, showing a lot of variety among the "people". 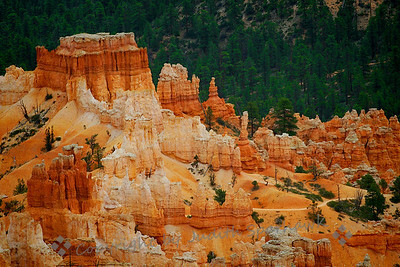 There are so many viewpoints at Bryce Canyon, I have no idea just where this was, but I liked that it gave an overview before starting to explore this amazing place. 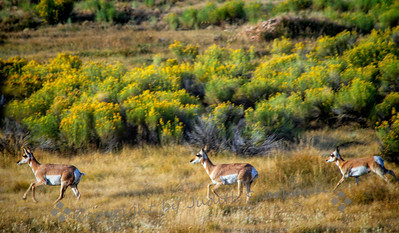 When photographing at Bryce Canyon, I liked zooming in to isolate some of the unique formations...which of course were everywhere! This is an example that shows very different shapes, sizes and colors. 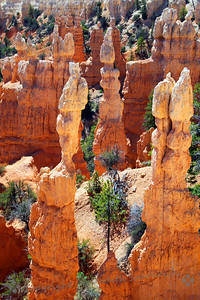 Fairyland Canyon is a separate canyon near Bryce. 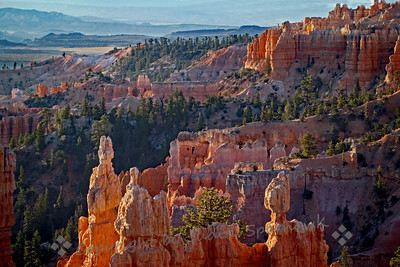 I purposely got there before sunrise so I could capture first light on the amazing rock formations. 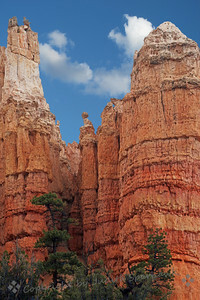 This view of Fairyland Canyon was after the sun rose, lighting up the rock formations in a magical way. Dragon at Canyon's Gate, on the "backside" of Bryce Canyon, Utah. From this angle, the rock formations create the look of a dragon, including the face, mouth, and its pointy back. This is near Mossy Cave. 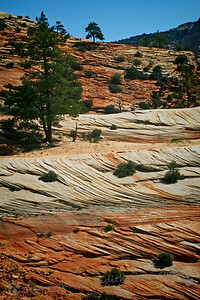 This formation was east of Bryce Canyon, near Mossy Cave, out of Tropic, UT. 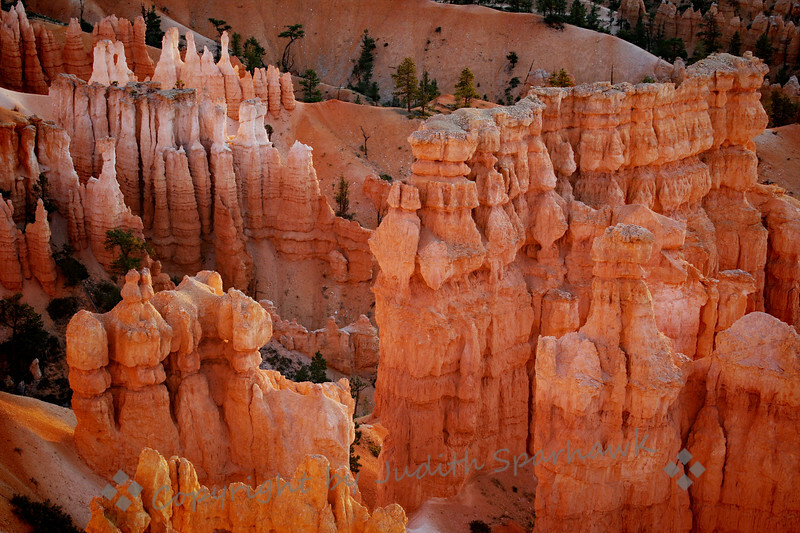 I liked the strong feel of the hoodoos and the variation of colors. 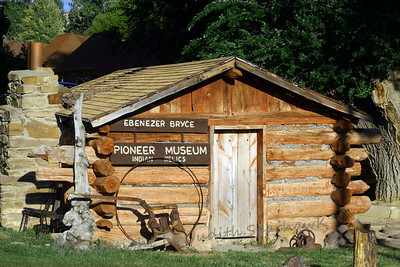 This shows one of Ebenezer Bryce's cabins, which now serves as a museum in Tropic, Utah. 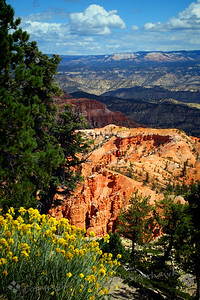 Tropic is on the east side of Bryce Canyon. 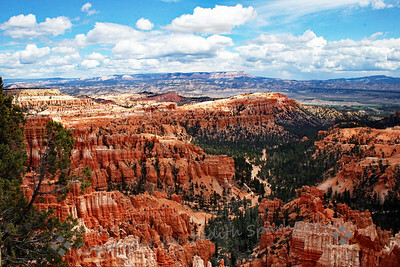 A common quote of Bryce's is reported to be that the canyon was "a hell of a place to lose a cow", though it is suggested that this Mormon homesteader originally from Scotland, would have not used this profanity. After he explored the canyon, Bryce described the fantastic formations and colors, and said that someday this will be a national park. 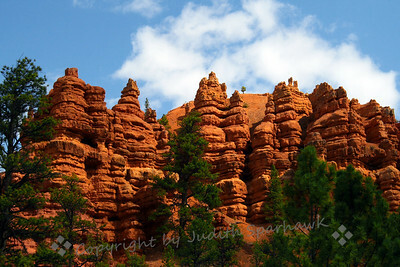 These hoo-doos in Red Canyon, Utah, are usually photographed from the other side. This was a view from behind, while hiking in the canyon. I liked the yellow flowers, red rock and blue sky.